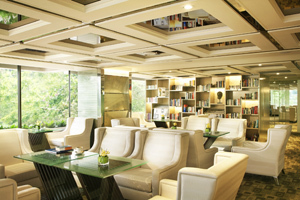 Regal Kowloon Hotel, Hong Kong has relocated and refurbished its Regal Club Lounge, providing a conference room for small group meetings. The 600-room property is located in the Tsimshatsui district on the island. The new lounge, located on the hotel's first floor, is wi-fi enabled. Alongside the conference room, there is a mini library equipped with books and DVDs.